AlphaCard has years of experience designing custom ID card systems for clients across industries. From small, low-volume printer systems all the way up to multi-location high-volume ID badge systems, we can help your organization find the best ID card system for your needs. Auto dealerships employ photo ID badges for staff and management, so customers can put their full trust in them. Most casinos now offer special cards for gaming called "players cards," which help to attract players, while making gaming more convenient. Church ID card programs work to secure church facilities while also helping to expand church membership and community involvement. Universities in America utilize ID badges for student ID, faculty ID, cashless payment, access control, and visitor badges. Construction site ID cards help secure construction zones by preventing unauthorized individuals from gaining access to restricted areas, equipment, and construction materials. 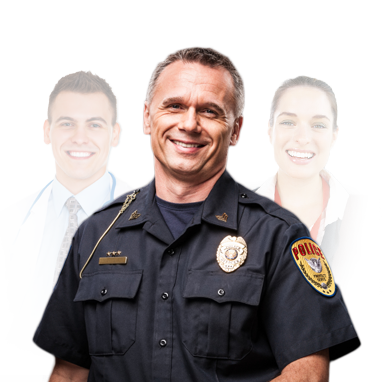 Emergency Services ID badges allow the public to quickly identify authorized emergency personnel at the scene of a crisis. Many employers, both big and small, now issue ID cards to their employees as a way to improve security and to identify workers. Fire department cards play a critical role in identifying firefighters and emergency personnel, and allowing access to employee-only areas. Government ID cards demand the highest level of sophistication and security, which is why a proper, well-planned ID card program is so important. Almost all gyms and health clubs now issue ID card to members as a way to protect facilities keep gym members safe. Healthcare ID badges can serve a number of functions, including identifying doctors and staff, controlling access to facilities and restricted areas, and managing visitors. The hospitality industry relies on ID cards for such uses as staff ID, time & attendance, access control, event badges, and much more. It’s important for in-home service workers to display valid ID cards when working at a client’s house to avoid confusion as to who they are and what company they work for. High schools, middle schools and even elementary schools have embraced ID card programs as part of a committed effort to improve security. Create secure staff ID cards, product information cards, business cards, membership cards and more for your legal marijuana business. A membership ID program is a great way to establish loyalty, whether for retail customers or members of a health club and sporting group. Military ID badges identify military personnel and help to secure facilities and highly sensitive data. ID is a key component to the military. Non-profit groups and charitable organizations turn to ID cards as a way to assist in their day-to-day operations. It's extremely important that police can properly identify themselves when on duty and during emergency situations. Restaurants and cafes frequently use ID cards and loyalty cards to instill trust with their customers and encourage them to come back. ID badges play a prominent role in retail, since retail employees display photo ID cards to inform customers who they are & their position. School photographers offer services that extend beyond snapping students’ annual yearbook photos, including issuing ID badges to students. Security badges play a critical role in identifying security workers, and controlling access to restricted areas where only authorized personnel are allowed. Professionals working in the field of senior care must have proper ID to ensure patients know who they are and feel comfortable in their care. Many ski resorts now issue durable photo ID cards as season ski passes for regular skiers and boarders, along with photo IDs for employees. Sports teams and athletic clubs utilize ID card programs to arm coaches and players with ID cards and provide game schedule cards for the season. Public attractions such as zoos and museums require ID badges for staff and visitors around-the-clock to make certain their identification is in full view. ID cards can be used for multiple purposes in the transportation & logistics industry, including staff ID, access control, time & attendance, and more. Veterinarians not only provide staff with ID badges, but use pet ID cards to give to customers, listing basic information concerning their pets. has everything you need to get printing.